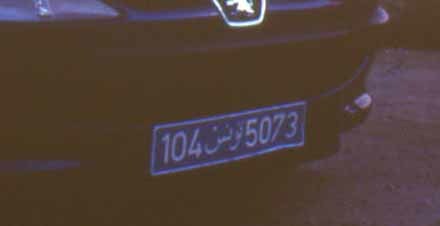 Boguslaw Bossowski submitted these photos of Tunisian plates taken in 2004. Normal series since 1975. تونس = Tunisia. Normal series since 1975. تونس and TN = Tunisia. Rental car series since the early 1980s. تونس = Tunisia. Numbers from the normal series are used. Colours are white on blue. Official vehicle series since 1994. Foreigner series since 2002. ن ت = Foreigners in work paying vehicle taxes monthly. 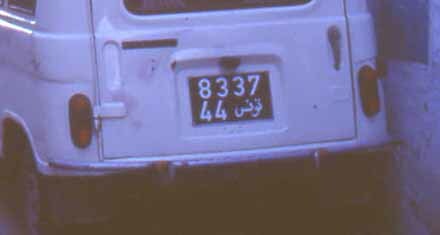 Tord Timmers Nilsson submitted these photos of Tunisian plates taken in 2003. On two line plates, the four digit serial number is placed on the upper line.